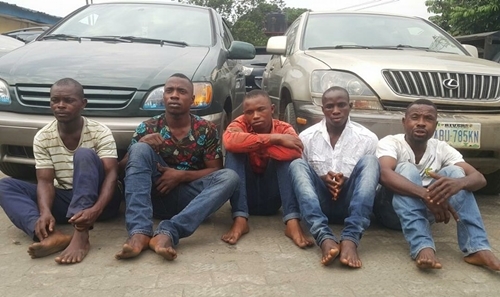 Five (5) notorious kidnapping members of the gang were arrested by the operatives in Aba, Abia State while several AK 47 rifle ammunition and operational vehicles were recovered. In some of the abductions carried out by the kidnap gang, victims and their families in the South East were made to pay sums ranging from N250, 000, N1million and N5.5million in US dollars equivalent. It reads, “Sequel to the kidnap of one Chief Felix Ogbonna, 80yrs old, on Sunday 26th November 2017 and his Subsequent release after Ransom was Paid, with technical support from TIU, Operatives of IGP Intelligence Response Team IRT deployed By IGP Ibrahim Idris swung into action and eventually arrested of 5 gang members of the New kidnap syndicate. "Chikachi Ubani aged 30 years. He is in charge of the stronghold and detention Camp where hostages were kept. The Police listed exhibits recovered from the gang to include AK47 Rifle, magazine/ammunitions, the operational vehicle – one Lexus 300 jeep, and a Toyota Sienna Bus.